VBAC Facts communicates differently than many others who speak or write about birth. Rather than advocating for a specific decision, I advocate for access to information. 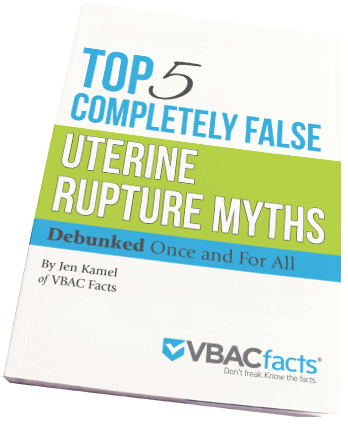 Specifically, the mission of VBAC Facts is to close the gap between what the best practice guidelines from ACOG and the NIH say about VBAC and repeat cesarean and what people generally believe. In meeting this goal, VBAC Facts makes hard-to-find, interesting, and pertinent information relative to post-cesarean birth options easily accessible to the people who seek it. VBAC Facts does not advocate for a specific mode of delivery, birth attendant or birth location. Because of this stance, sometimes people are a little confused. They are accustomed to outspoken advocates (arguing for either the pro or con) urging them to have a certain type of birth at a prescribed location with a specific type of birth attendant – or none at all. I also tend to avoid the often hollow sounding, “It will all be fine” or “I had a VBAC, so should every woman!” To some people, that comes off as anti-this/pro-that… but for me, it’s a fair look at our choices. But minimizing risks deprives women of their right to informed consent and that is really no different than individuals who exaggerate risk. I don’t advocate for women to birth a certain way in a certain location. A big part of my philosophy is based on the fact that I have a website and a large readership. I don’t want anyone to ever come back to me after a bad outcome and say, “You misled me.” I feel an obligation to be honest and truthful about the pros and cons of options as well as the quality and quantity of research available to us. Women often feel misled by their HCPs [health care providers]. I don’t want to be part of that misinformation machine. My mission is simple: to make hard-to-find, interesting, and pertinent information relative to post-cesarean birth options easily accessible to the people who seek it. Someone recently posted in a group asking how they can get involved with birth advocacy. Other members and myself directed them to a variety of organizations like ICAN, Improving Birth, the National Advocates for Pregnant Women, the ACLU, and Human Rights in Childbirth. There are many roads to the same destination. You can advocate right now by going on message boards and simply pointing people to accurate information when they ask questions. Sometimes all they need is to see a little bit that suggests what they have accepted as “truth” is the opposite of what major medical organizations, public health professionals, and medical researchers support and recommend. I have said many times, “Birth is not one size fits all.” As ACOG says, two women can look at the exact same information and make very different choices. There is not a Right or Wrong decision for all women, just a right or wrong decision for a specific woman. That is her decision to make based on information, not bullying or hysteria. I always love your post. I love how well reserched they are and how much information you really provide to allow moms to make an INFORMED decision. While my blogging is no where near as referenced 0_o LOL…. my advocacy style is similar. I often have to start off saying “I am NOT for everyone having a natural birth…” I just want women to get the information…most importantly TRUTH so that they can make good choices for themselves. Thanks for all you share and write. Forget those that dont get it 😉 and keep up the good work!! Love it! I appreciate your style of advocacy very much. In my opinion, one of the biggest injustices women who face birth choices after a c-section is that so many care providers only provide information supporting the choice they want women to choose. Too often, that amounts to exaggeration, scare-tactics, and bullying. If birth advocates resort to the same methods to “promote the cause”, the result will be the same – women making choices based on misinformation, fear, or frustration instead of making decisions based on what they feel is best for them and their families. Thank you for consistently seeking to share the truth as it is. Having a homebirth with *this midwife* would be the *safest* option for *me* and *our baby*. At this point, I am faced with the reality of navigating another pregnancy without my beloved (retired) midwife. Although I can’t believe I’m doing it, I’m interviewing an OB/GYN in 2 weeks. I have no great hopes that my hospital options have improved much, but I at least want to be able to say that I looked into it. I also have a long list of midwives to talk to–none of whom are as local to me or as experienced as my former midwife was. In some ways, the decision will be easier this time. I have a “proven pelvis” and a “proven scar”. I know, for example, that I go into labor naturally at around 41.5 weeks, and that none of my babies were “big” despite their “old” gestational age. I know I have long labors with little “progress”, followed by very quick dilation and short 2nd stage. My less-than-textbook labor quirks may scare a few folks off. On the other hand, hopefully whoever we decide to go with will not be surprised that I vomit the whole time or that I go from 2-10 in an hour. All that to say that I totally agree with you: every woman is different, and each one of us needs to consider our own circumstances when making the choices as to how, where, and with whom to birth. In general, I do think that homebirth with a qualified midwife is a safe option for most women…including many of us with scars. However, I would never pretend that it is the perfect, risk free option for every mother. If a mother lives in a community with a wonderful hospital birthing center that has a low c/s rate and a high vbac success rate, but no homebirth midwives, her decision would probably be completely different from mine, in a community full of hospital vbac bans/almost bans and several reputable midwives to choose from. Again, thanks for your work! I often refer friends who are interested in knowing their post-cesarean birth options to your site. Many Blessings!